Do you wonder why your child developed a sunburn in patches or even as a handprint? 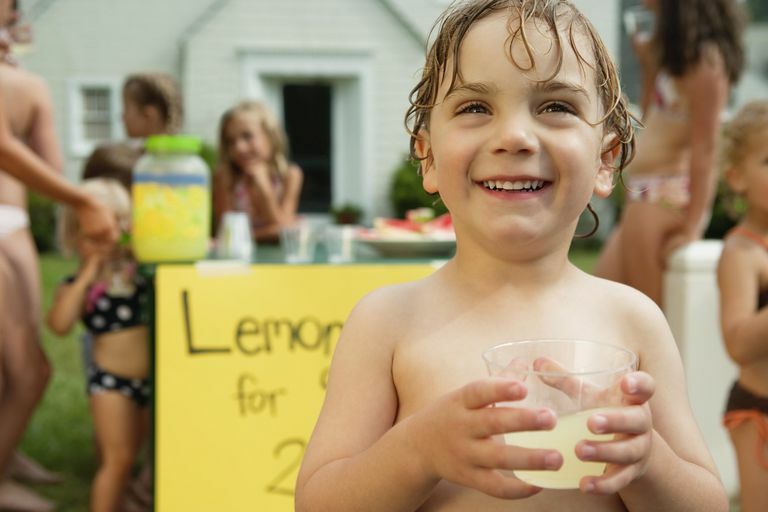 You may have taken common precautions for your child but not realized that skin contact with lime juice, lemonade, grapefruit, or even celery may put children at risk for phytophotodermatitis. Refreshing summer drinks often include citrus or celery, so you need to be aware of photosensitizing plant compounds that make skin extra sensitive to sunlight. This can leave you or your child feeling burned after sun exposure. Learn the steps you can take to protect yourself and your kids. The easiest solution is preventing skin contact by washing hands and the entire face after consuming citrus fruits or celery or contact with wild plants. Citrus fruits and celery can cause a sun-induced skin sensitivity condition known as phytophotodermatitis. The condition occurs when dripping juice from fruits such as limes, lemons, oranges, grapefruit, celery, carrot, fig, parsley, parsnip, hogweed, or rue come into contact with the skin. Other plants may produce the same effect in certain individuals, so check with a medical professional if you fear you're at risk. This is a form of contact dermatitis but it only produces a reaction after exposure to the sun and it isn't produced by an immunologic reaction. Most sun-related skin conditions, such as sunburn, affect all areas of skin that are exposed to sunlight. But phytophotodermatitis is different because its reaction is triggered specifically by chemicals on the skin so only the skin affected by those toxins reacts when exposed to the light. The reaction may appear in unusual patterns of streaks, drips or as fingerprints or handprints. The handprint formation is common on children because if an adult has the chemicals on their hands and applies sunscreen to their child or touches their skin, the reaction will only appear in the area. Symptoms usually develop within 24 to 48 hours after sunlight exposure. Patients may have initial burning erythema (red skin) followed by blisters. Phytophotodermatitis can cause strong reactions, resulting in sunburn, rash, hives, and blistering. Others may be unaffected by the condition, even if juice from the offending fruits touches their skin. Those vulnerable to sunburn, however, should take precautions. The skin will be darkened in the area of the lesions after one to two weeks and will remain darker for months before fading. Treatment for phytophotodermatitis can typically be done at home without medical intervention. Wash the area using mild soap and water, or soak in a cool oatmeal bath to soothe your skin. Then wet a washcloth with cool water and put it on your rash. Do this several times a day. This will help decrease itching, pain, and swelling. You may use anti-itch creams or hydrocortisone cream to reduce inflammation, but do not use them on broken skin. Severe cases may require oral antihistamines or even a steroid shot or pill. If the area is persistently painful, or if blisters are severe, talk to your doctor. Always wear sunscreen, especially because your skin may be sensitive to the sun after you get phytophotodermatitis. Parents and childcare providers should make sure kids wash their hands and faces carefully (or even arms and legs if they are particularly messy eaters) before heading outdoors. When you are away from home or eating outside, consider bringing along wet wipes or damp washcloths placed in a plastic bag for an easy way to wash off. Explain the risk to children if they resist washing up after consuming citrus fruits and other plants that cause phytophotodermatitis. If the child won't cooperate, you may have to keep him inside or deny him citrus fruits when it's hot outside. If you notice the symptoms after plant contact rather than food, such as after hiking or playing in a field, you may have to ensure your child wears long pants and long sleeves when in wild areas. Wash areas that were exposed. Hankinson A, Lloyd B, Alweis R. Lime-induced phytophotodermatitis. Journal of Community Hospital Internal Medicine Perspectives. 2014;4(4):25090. doi:10.3402/jchimp.v4.25090. Moreau JF, English JC, Gehris RP. Phytophotodermatitis Journal of Pediatric and Adolescent Gynecology 27.2 (2014): 93-94.